Many streets flooded instantly after heavy rains fell on Tuesday afternoon. Photo via Sify.com. A couple of weeks ago, I wrote the first post for a series following Mumbai through the monsoon. On June 11, the monsoon officially arrived in Mumbai, signaling the start of an annual test of the city’s transportation infrastructure. 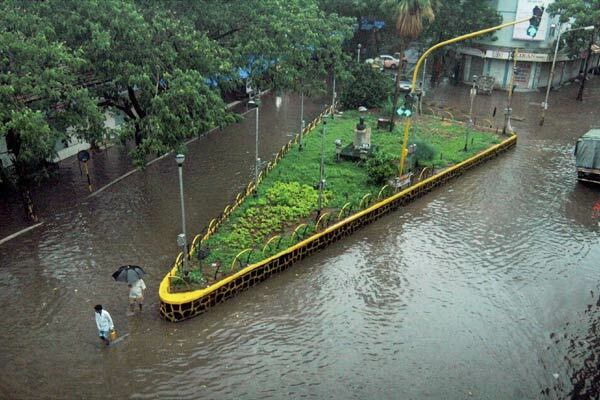 After less than a week of lashing rains, Mumbai’s transit infrastructure is failing the test. 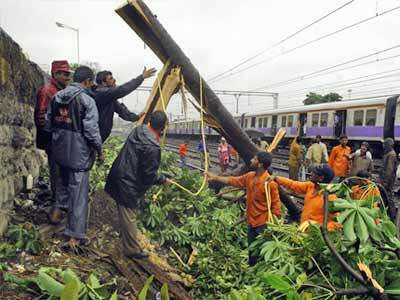 A tree falls on the tracks near Dadar station due to heavy rain. Photo via Mid Day. Between Tuesday and Wednesday mornings, Mumbai received 60.77 millimeters of rain. As a local newspaper reported, this “threw life out of gear” for commuters in the city. Clogged drains, which had worried residents before the rains, overflowed instantly, streets flooded and jammed traffic, and rail transit was stalled by flooding and fallen trees. There was also substantial flooding at Milan subway, in the Santa Cruz section of Mumbai, where the Indian Meteorological Department (MET) recorded 95 millimeters of rainfall from Tuesday to Wednesday. 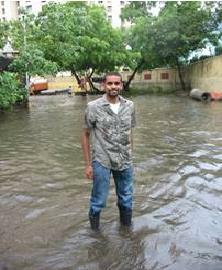 Staff from EMBARQ (the producer of this blog) working at the Centre for Sustainable Transport in India were forced to don their “gum boots” and wade through flooded streets to make it to the office on Wednesday morning. EMBARQ intern Vig Krishnamurthy wades through a street nearby EMBARQ's Mumbai office. Photo via Tahira Thekaekara. Municipal Corporation of Greater Mumbai issued a “high tide” alert for the city, warning all Mumbaikers to keep away from the coast, and alerting residents of low-lying areas that more flooding is imminent. High tide on Wednesday afternoon reached a dangerous level, at nearly 5 meters. 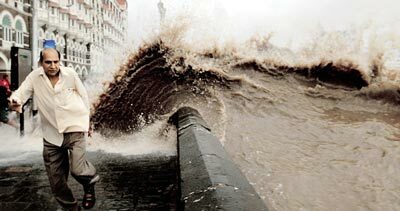 Mumbai's high tide reached nearly 5 meters on Wednesday afternoon, flooding coastal roads. Photo via Mumbai Mirror. In Thane, a northern suburb of Mumbai, eight people were killed when the wall of a building under construction collapsed on their nearby slum dwellings; many more were trapped under debris. Another under-construction building collapsed in Mulund and killed one person; and a 9-year-old girl died when a stairway collapsed. Early flooding is worrisome: the deadly Mumbai floods of 2005 remain on everyone’s minds, and eight people already lost their lives because of infrastructure failure in the city. We will be watching the city cope with the rains to continue offering potential solutions to avoid transit mayhem during monsoon season. With regard to the early floods, the clearest solutions would be more efficient drain cleaning and coordination among city officials, and more rigid enforcement to ensure ongoing infrastructure projects are left at “monsoon-safe” stages.